Philadelphia, PA -- Darrun Hilliard scored 15 points and grabbed six rebounds, helping seventh-ranked Villanova beat No. 24 Georgetown 69-53 Saturday at the Wells Fargo Center. Josh Hart added 13 points and JayVaughn Pinkston had 10 with eight rebounds for the Wildcats (21-2, 8-2 Big East), who have won four games in a row and avenged a 20-point loss in the nation's capital on Jan. 19. The Hoyas have been inconsistent since routing the Wildcats, losing three of five. L.J. Peak scored 15 points to lead Georgetown (15-8, 7-5), which was held to 30 percent shooting and made just 1-of-17 3-point attempts. Though the names wouldn't evoke battles of Big East past, the physicality of the contest harkened back to those Rollie Massimino and John Thompson coached teams which essentially fought for every inch of space more than a generation ago at the height of the conference's profile. An Isaac Copeland jumper put the Hoyas up 7-6, but that proved to be their final lead of the game. Hilliard hit a 3-pointer to kick-start a 13-0 run that Hart capped with a layup for a 19-7 advantage. Georgetown missed 14 of 16 field goals during one stretch in the first half and fell behind by as many as 17. D'Vauntes Smith-Rivera's jumper opened the scoring in the second half, trimming the Hoyas' deficit to 37-25, but that was as close as they got. Kris Jenkins nailed consecutive 3-pointers to make it 51-29 with 13:49 remaining, and the Wildcats' lead reached a game-high 24 points a few minutes later. 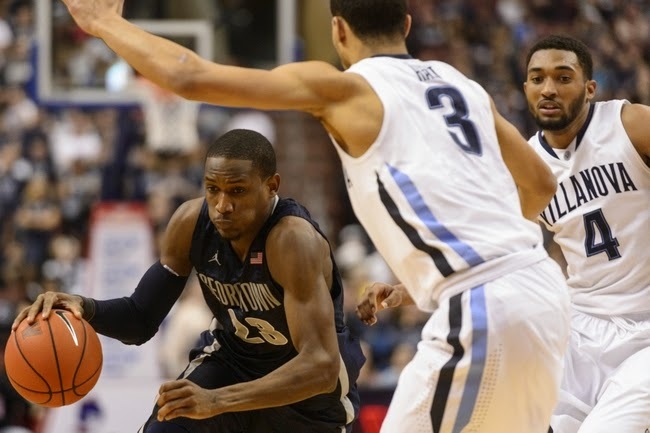 Notes: Villanova finished 12-of-24 from 3-point range and shot 47.8 percent overall ... The Hoyas produced only eight points off a season-high 20 Wildcats turnovers ... Jenkins and Ryan Arcidiacono each had nine points for Villanova ... Aaron Brown scored 10 points for Georgetown.